After the cliché laden clunker that was the pilot episode of SHIELD, you can imagine my trepidation going into the second episode. Despite my concern, however, I do like to give every new series three episodes before deciding whether or not I’ll continue watching on a week-by-week basis. As I also mentioned in last week’s review, I had a hope that without Joss’ direct input, the series could improve past the snark and heavy handed references. The bad news is, the episode doesn’t start off on the right foot, with some VFX that just don’t quite look right – even for a TV show – and a fairly stereotypical ‘hero has to get out of impossible’ situation, followed by ‘[insert arbitrary timeframe here] hours earlier’. So far, so average. In addition, the further we get into the episode, the more obvious it becomes that Agent Cardboard Cutout isn’t going to become any more animated any time soon. The good news, is that while the production values are still mediocre when compared to high budget cable series (which is where the pilot episode should have been sitting, considering its reported $14m budget), the show looks far more polished this week, and looks great for a network TV show. Sets look less studio backlot, and more like they were shot on location. The visual effects are still a bit iffy in places, but are generally pretty good, and the acting has improved vastly. The great news, is that this episode is engaging. It’s clever, witty, and self referential in a way that doesn’t whack you over the head with an embarrassing desperation to please all the fanboys (and girls) this side of Jupiter. While many will look at the script and see huge similarities between the pilot and 0-8-4, the major difference here is subtlety. Lines are delivered in a far more low key manner, rather than with a comical, over the top facial expression, and a tone dripping with irony. While the writing team was hanging lampshades all over this episode (particularly in reference to Skye’s place on the team), rather than expecting to hear a ba-da-boom-tsssch drum punchline, they garner a chuckle, and a smile. This episode is fast paced, fun, and a little silly in places, but not so much that it becomes tiresome. Last week, I bemoaned the likelihood of getting something like Burn Notice or Covert Affairs, with a bit more grittiness thrown in. This week, we got the next best thing – something that resembled a cross between Burn Notice and Covert Affairs. Enjoyable, episodic but with the undercurrent of a longer plot, and with a slight feel of guilty pleasure about it. Jed Whedon, Maurissa Tancharoen, and Jeffrey Bell have done a great job of the script. There are still a few moments where I could have struggled to suspend my disbelief, but the whole episode is so nicely put together that I found myself not caring. I was particularly impressed with the dramatic shift in the quality of the acting, and if this is down to David Straiton’s direction, then I applaud him. Where most of the actors felt like they were reading from an autocue during the pilot, in 0-8-4 they actually feel like they’ve learned their lines sooner than two minutes before walking on set. Agent Cardboard Cutout is still a weak link, but at least he sounds like his accent isn’t something I put on after a few too many drinks on a Saturday night. One real revelation for me was Skye. While in the pilot, she felt like an attempted replacement for Darcy Lewis (who, if you’ve read the Thor: The Dark World prelude comics, you will know managed to hack SHIELD without much preamble), in 0-8-4 she’s really settling in to her character. Her place on the team is called into question a number of times, including by herself, and at the end of the episode we start to get an inkling of her real motivations. The rest of the team (apart from Cardboard), are also well characterised and acted. Melinda May’s woman of few words personality is reinforced, and I’m really excited to see more about how she came to be who she is. Fitz and Simmons are more of the same high speed talking over the top of one another, and despite Skye being the clear attempt at an audience surrogate, I can’t help but relate to these two far more. I’m a little uncomfortable with the obvious attempt at creating sexual tension between Skye and Cardboard, when there’s very little chemistry between the actors. Suggesting that Cardboard will become her trainer towards the end of the episode doesn’t help with those reservations. I just have my fingers crossed that they’ll subvert this somehow and move on. Or more to the point, I hope my theory on the conversation between Agent May and Agent Cardboard is correct, but you’ll have to wait to find out what that is. Coulson is firmly back in character, benign expression in place, dropping the odd terrifyingly efficient threat. It’s great to see him get a bit of history, with Leonor Varela guest starring as Peruvian Commandante Camilla Reyes, with whom Phil has an history of not much working. Go Phil, you dog! It’s a relief to see the name drops and references delivered with far less of a feeling that the actors are winking at the camera. While a bunch of existing MCU characters and ideas get nods in this episode – the device they’re recovering is supposedly based off the HYDRA WWII weapons from CA:TFS – they fit nicely into the flow of dialogue, and actually got my brain ticking over with ideas, rather than being the basis of an eye roll. I have a few theories on some of the carrots that are continually being left dangling in front of the audience’s noses, like Coulson’s magical time in Tahiti, and this episode has me actually excited to find out what the reveals are going to be. Just feels like a bunch of recycled ideas drawn from The Avengers movie playbook: Rag tag group sets asides differences and joins together against a “common enemy”. Melinda May is literally Asian Black Widow (badass assasin, holds a lot of baggage/guilt). 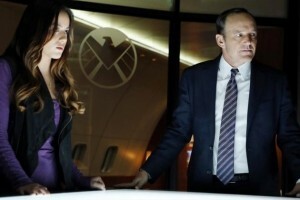 Coulson’s loving “old fashion” stuff in order to ground himself in a changing world. That being said, I’m sure this show is perfect for middle school children..fun, full of action, lots of fun tech stuff. But then that is kind of a signature of Marvel in general, so I don’t think anyone is really particularly surprised about that. It doesn’t even really factor into my enjoyment of the show, seeing as I’ve been ignoring it for the last twenty years when reading comics.